Human stem cells have shown potential in medicine as they can transform into various specialized cell types such as bone and cartilage cells. The current approach to obtain such specialized cells is to subject stem cells to specialized instructive protein molecules known as growth factors. However, use of growth factors in the human body can generate harmful effects including unwanted tissue growth, such as a tumor. Researchers at Texas A&M University have explored a new class of clay nanoparticles that can direct stem cells to become bone or cartilage cells. Dr. Akhilesh Gaharwar, an assistant professor in the Department of Biomedical Engineering, and his students have demonstrated that a specific type of two-dimensional (2-D) nanoparticles, also known as nanosilicates, can grow bone and cartilage tissue from stem cells in the absence of growth factors. These nanoparticles are similar to flaxseed in shape, but 10 billion times smaller in size. 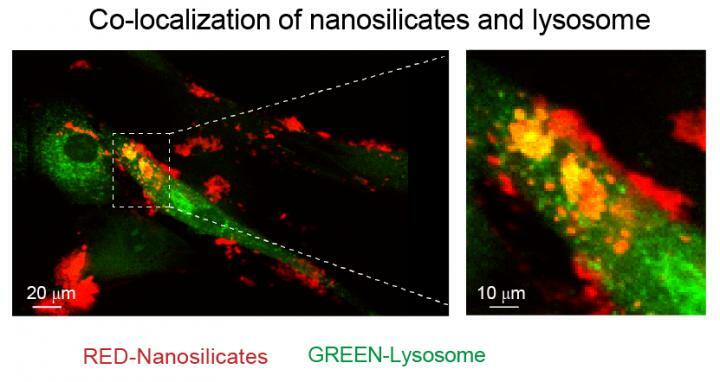 Their work, "Widespread changes in transcriptome profile of human mesenchymal stem cells induced by two-dimensional nanosilicates," has been published in Proceedings of the National Academy of Sciences this week. Two-dimensional nanomaterials have gained increasing popularity over a variety of fields, such as energy, optics and regenerative engineering, due to their extremely small size and unique shape. These nanoparticles consist of highly organized atomic layers made from minerals. The minerals are abundantly present within the human body and help in some vital functions. To understand how these nanoparticles interact with stem cells, we utilized a next-generation sequencing technique called RNA-seq," said Irtisha Singh, a computational biologist from Weill Cornell Medicine at Cornell University and the corresponding author. "RNA-seq takes a snapshot of gene activity of the cell at any given moment. This is similar to taking a high-resolution photo during the Super Bowl and identifying the reaction of every fan during the touchdown." RNA-seq uses next-generation sequencing (NGS) to reveal the presence and quantity of RNA in a biological sample at a given moment. For example, cell-nanoparticle interactions can result in significant change in cellular behavior that can be observed by using this technique. "This technique is very sensitive to investigate the interaction of a wide variety of nanomaterials with cells," said Jake Carrow, a doctoral candidate in Gaharwar's lab and co-first author of the study. "With this combination of nanotechnology and computational biology, we can better understand how a material's chemistry, shape and size can contribute to cell functions." From this study, nanosilicates demonstrated some very interesting capabilities when applied to adult human stem cells. These cells presented signaling typically observed during regeneration of bone and cartilage. This indicates a great deal of potential for these nanoparticles as a possible therapy against osteoarthritis among other orthopedic injuries. This cellular response is believed to originate from the unique physical and chemical composition of the nanoparticles. This premise of mineral-based particles affecting cell behavior has opened the doors to the development of new class of therapies. "The ability to customize a therapy to a specific tissue, simply by changing the mineral content within the nanoparticle, presents a great potential within the field of regenerative engineering," said Lauren Cross, also co-first author on the publication. "We believe this new field of 'mineralomics' can provide a viable alternative compared to the current treatments existing today." This research is funded by the National Institute of Biomedical Imaging and Bioengineering. The Gaharwar Lab targets cell-biomaterial interactions across multiple biological scales. His group is specifically interested in the repair and regeneration of biological tissues through the use of nanoengineered biomaterials. See more details at "Inspired Nanomaterials and Tissue Engineering Laboratory."